It was one of those rare visits to Walmart that brought the Van’s Gluten Free Pasta selection into my life. My local Walmart has a small, but very diverse, gluten-free section. I don’t make it a habit to shop there, but if I have to go in there for something, I always swing by that section to see what there is. So often, I find items I haven’t seen anywhere else. That was the case…back then…when it came to the Van’s Gluten Free Pasta meals/sides. I hadn’t seen or found them anywhere else. Now, I pretty much can find them everywhere in the wild…but this was a new thing. And I admit to snatching up all three varieties to add to my pantry. It is no secret that I am a pasta lover. I mean…growing up, spaghetti was my favorite dinner ever. I would beg my mom to make it each week. I wanted it on my birthday. I wanted it for breakfast. I’m Irish by heritage, but I think I’m Italian somewhere too. What? The pale skin and reddish-blonde hair don’t make you think Italian? HA! Anyway…these have been sitting on my pantry shelf for a little while now. I never really had a reason to bust them out. I churn through my CSA bin stuff first and then hit up the stuff in my pantry. But, I’ve been on a CSA bin drought this past week as I was away at a friend’s house so put a hold on the bin. This means…dinners were now being prepared by the items I still had in my pantry/fridge/freezer. I am paying off Christmas plane tickets…I wanted as little on my grocery list as possible. The week was going well. But I realized I have a trip coming up. A fun and exciting trip with my roomie, her sister, and her brother-in-law. Heading to Charleston, South Carolina. I have never been, but everything I have heard about it makes me so excited to be going. I am really looking forward to it. But, what I did realize was that we hadn’t all gotten together to discuss the trip and what we wanted to do. So…we got in touch with Amanda and she said she was able to come over last night. And I was now hunting for a dinner for the three of us. When I hit up the pantry, my eyes immediately fell on the Van’s Gluten-Free Pasta meals/sides. I pulled out the box…and each box served three. PERFECT. Now it was just a matter of selecting the flavor. I asked my roommate which one sounded good to her, and she said that she was interested in the Creamy Herb & Garlic flavor. With that settled…I was now prepared for dinner for three. I paired it with vegan and gluten-free garlic bread and gluten-free rosemary bread sticks, which were kicking around my freezer. After work yesterday, I knew Amanda would be on her way. So, I immediately got into the kitchen and put a pot of water on to bring it to a boil. She arrived just as the water was starting up…so it was perfect timing. I opened up the box of Van’s Gluten Free Creamy Herb & Garlic Pasta, being greeted by red penne noodles and a little plastic pouch of seasoning. I removed the pouch and poured the red noodles into the pot, giving it a stir and letting it come back up to a boil. The bread went into the oven to warm through and I spent the rest of the time getting out the almond milk and the vegan butter needed to prepare the rest of the dish. And I was still able to entertain and carry on a conversation. This dish is definitely not labor intensive. LOVE that. As much as I love being in the kitchen, when I have people over, I want to spend my time with them…not hovering over the oven or stove. The box stated that it would take about 8-10 minutes for the pasta to cook through to the perfect al dente. I think it took about 10-12 minutes for me. But…it eventually got there. I turned the burner down to low and removed the pot from the heat, pouring out the contents and letting the noodles drain. I then dropped the 2 tablespoons of butter and 3 tablespoons of (almond) milk into the pot and let it all melt together. Then…in went the seasoning packet. I gave it a stir and just worked it together until this thick and delicious smelling sauce emerged. Then…the noodles went back into the pan and I stirred it all together, coating each noodle to perfection. There was no excess sauce. Just the perfect amount. And it looked awesome. The garlic bread and bread sticks finished up and I pulled them from the oven and sliced each one into thirds. Then, I dished up the Van’s Gluten Free Creamy Herb & Garlic Pasta into three bowls and delivered one to Amanda, one to Cathy, and kept one for myself. Dinner was served. I won’t lie…I was beyond nervous to be serving something up to Amanda that I hadn’t tried yet. She is always willing to try my gluten-free foods and is very patient with me…but sometimes a new product is a bust…and being that this was untested by me…I was just hoping for the best. But…we all came to the same consensus. It was BEYOND delicious. WOW! The flavor profile was amazing. The sauce is creamy, without being too much. It brings this great garlic flavor, without being overpowering. And the earthy herbs lend a depth of flavor to each bite. The red noodles looked fantastic coated in the sauce, and they provided a perfect vehicle for the creamy nature of the sauce itself. We devoured this meal. Honestly. And the entire time couldn’t stop talking about how good it was. SCORE! I should have known not to doubt Van’s when it comes to their gluten-free products. I haven’t met one I have disliked yet. Let’s talk ingredients! 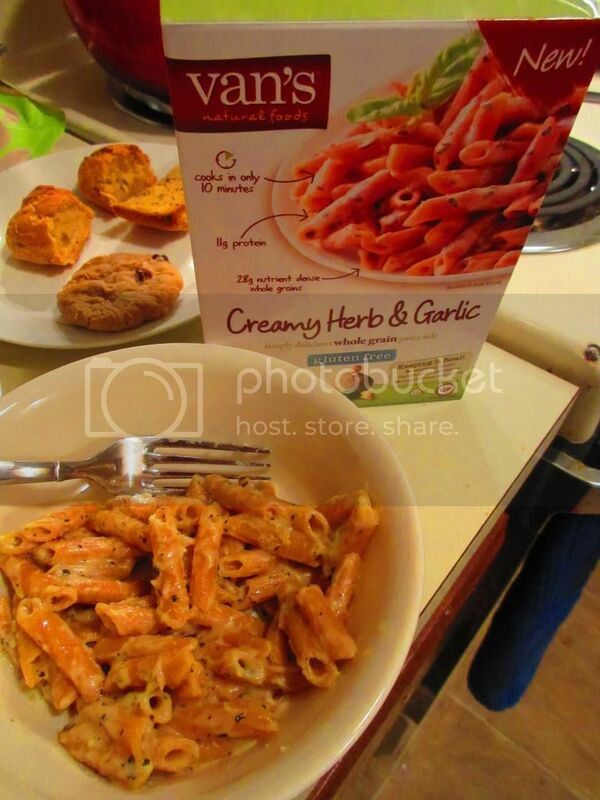 The Van’s Gluten Free Creamy Herb & Garlic Pasta is made with gluten free penne pasta (brown rice flour, red lentil flour, beet powder, tomato powder), garlic and herb seasoning (reduced lactose whey, rice flour, milk powder, parmesan and romano cheese, natural flavors, salt, sugar, spice, and garlic powder). It is low in fat, low in calories, and filling. As for the nutrition information, a serving of the Van’s Gluten Free Creamy Herb & Garlic Pasta is 1/3 of the box, or about 2.4 ounces (68 grams). This serving will provide you with 320 calories and 3 grams of fat. You will also be consuming 5 mg cholesterol, 46o mg sodium, and only 2 grams of sugar. That’s really good for a packaged pasta with a sauce. Trust me. And, finally, the serving gives you 3 grams of fiber and 11 grams of protein. Trust me, you may find the serving to appear small, but you will feel full after eating it. It wasn’t just amazing…it felt like a full meal! Perfect serving size of pasta too. If you are like me and try to keep a few items in your pantry for those nights you don’t really have a lot of time to cook…or want to hit up the grocery store for special ingredients…be sure to keep some of the Van’s Gluten Free Pasta dishes in your pantry. I love how this one turned out and now I can’t wait to try out the other two varieties in my pantry. In addition to the Creamy Herb & Garlic, Van’s Gluten Free Pasta includes flavors such as Ultimate Cheddar Penne and Rotini and Red Sauce. I’m already looking forward to the next excuse to make this easy-to-prepare pasta dinner. SO much love. You really need to give it a try…seriously. Just…do it! This entry was posted in Bread, Cheese, Entree, Food, Gluten-Free, Italian, Mix, Pasta, Products, Review, Sauce, Side Dish, Vegetarian by The Celiathlete. Bookmark the permalink.